PowerCommands is a set of useful extensions for the Visual Studio 2008 adding additional functionality to various areas of the IDE. 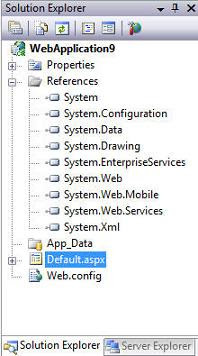 The source code is included and requires the VS SDK for VS 2008 to allow modification of functionality or as a reference to create additional custom PowerCommand extensions. Visit the VSX Developer Center at http://msdn.com/vsx for more information about extending Visual Studio. The Releases page contains download files (MSI installation file, readme document, and source code project). 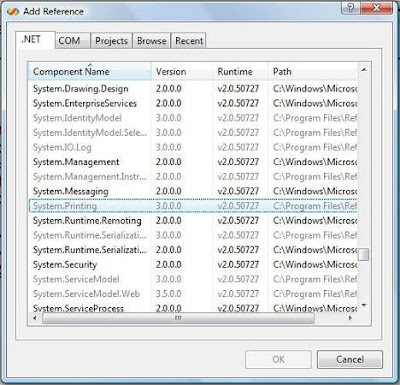 Below is a list of the included in PowerCommands for Visual Studio 2008 version 1.0. Refer to the Readme document which includes many additional screenshots. 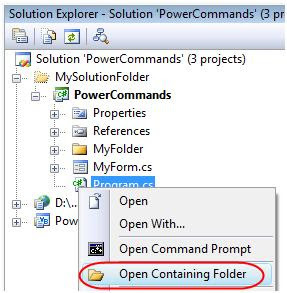 This command collapses a project or projects in the Solution Explorer starting from the root selected node. Collapsing a project can increase the readability of the solution. This command can be executed from three different places: solution, solution folders and project nodes respectively. This command copies a selected class entire content to the clipboard, renaming the class. This command is normally followed by a Paste Class command, which renames the class to avoid a compilation error. It can be executed from a single project item or a project item with dependent sub items. This command pastes a class entire content from the clipboard, renaming the class to avoid a compilation error. This command is normally preceded by a Copy Class command. It can be executed from a project or folder node. This command copies a reference or set of references to the clipboard. It can be executed from the references node, a single reference node or set of reference nodes. This command pastes a reference or set of references from the clipboard. It can be executed from different places depending on the type of project. 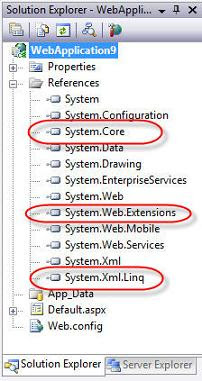 For CSharp projects it can be executed from the references node. 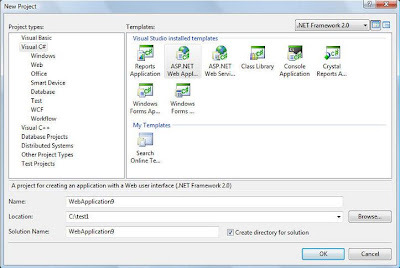 For Visual Basic and Website projects it can be executed from the project node. This command copies a project as a project reference to the clipboard. It can be executed from a project node. This command opens the MSBuild project file for a selected project inside Visual Studio. It combines the existing Unload Project and Edit Project commands. This command opens a Visual Studio command prompt pointing to the physical path of a selected item. It can be executed from four different places: solution, project, folder and project item nodes respectively. This command unloads all projects in a solution. This can be useful in MSBuild scenarios when multiple projects are being edited. This command can be executed from the solution node. This command reloads all unloaded projects in a solution. It can be executed from the solution node. This command removes and sort using statements for all classes given a project. It is useful, for example, in removing or organizing the using statements generated by a wizard. This command can be executed from a solution node or a single project node. Note: The Remove and Sort Usings feature is only available for C# projects since the C# editor implements this feature as a command in the C# editor (which this command calls for each .cs file in the project). This command creates a constant definition statement for a selected text. Extracting a constant effectively names a literal value, which can improve readability. This command can be executed from the code editor by right-clicking selected text. This command clears the Visual Studio recent file list. The Clear Recent File List command brings up a Clear File dialog which allows any or all recent files to be selected. This command clears the Visual Studio recent project list. The Clear Recent Project List command brings up a Clear File dialog which allows any or all recent projects to be selected. This command executes a custom tool with associated text templates items. 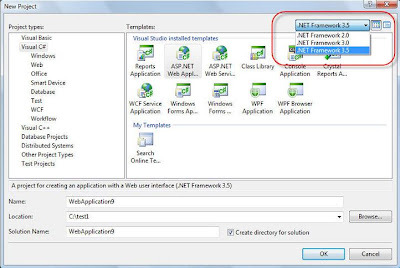 It can be executed from a DSL project node or a DSL folder node. This command closes all documents. It can be executed from a document tab. The DataBinder.Eval method uses .NET reflection to evaluate the arguments that are passed in and to return the results. Consider limiting the use of DataBinder.Eval during data binding operations in order to improve ASP.NET page performance. When you create an ADO.NET DataReader object, specify the CommandBehavior.CloseConnection enumeration in your call to ExecuteReader. This ensures that when you close the DataReader, the SQL connection is also closed. This is especially helpful when you return a DataReader from a function, and you do not have control over the calling code. If the caller forgets to close the connection but closes the reader, both are closed when the DataReader is created by using CommandBehavior.CloseConnection. This is shown in the following code fragment. I often need to open Windows Explorer and browse to the current file, folder, or project that I am working on in Visual Studio. This tip allows you to achieve this by clicking “Windows Explorer” in the Tools menu, and is one of the most simple-yet-useful tips I know of. Leave Initial directoy blank, and click OK. Now when you click Tools, Windows Explorer, Windows Explorer will open with the current file you are editing selected.